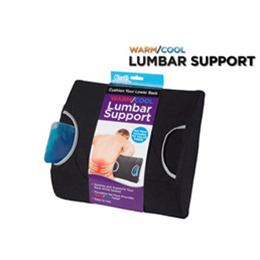 The Contour Warm/Cool Therapeutic Lumbar Support is a versatile support with a 2-in-1 design. Use this support as a comforting lumbar support or for warm/cool therapy to your lower back. The design of this lumbar support helps provide proper alignment for more comfort. A built-in fabric sleeve securely holds an extra-large reusable gel pack (included). Perfect for any chairs or seats! A infinity strap is included to attach the lumbar support to your chair. Available in colors Blue and Black. Package Dimensions: 16.5" x 14.8" x 14.8"